As someone who has spent over a decade in the marketing departments of a couple of companies, you would think I'd be better at marketing myself and my work, but I'm kind of crap at it. I think it goes back to being little and somewhere along the way being told it's not nice to brag. And while marketing myself may not exactly be bragging, for me it has a tendency to feel that way, so I've always been very hesitant to do it. I'm trying to get better though. To show my work without it feel like I'm showing off. It's kind of a fine line. However, that necklace in the above photo? I kind of want to brag about that. I was so honored and amazed, I was almost speechless. The jeweler did an awesome job and I think it turned out really great. As I've mentioned before, I don't wear necklaces that often, but I do really like to wear this one. Not just because it's "mine" but because it reminds me of my lovely friends. So does it count as bragging if you get all mushy about it? \n\n\nAs someone who has spent over a decade in the marketing departments of a couple of companies, you would think I'd be better at marketing myself and my work, but I'm kind of crap at it. I think it goes back to being little and somewhere along the way being told it's not nice to brag. And while marketing myself may not exactly be bragging, for me it has a tendency to feel that way, so I've always been very hesitant to do it.\n\nI'm trying to get better though. To show my work without it feel like I'm showing off. It's kind of a fine line.\n\nHowever, that necklace in the above photo? I kind of want to brag about that.\nJust a little.\n\nIf you've been reading for a while, you might remember that I started taking a tribal belly dance class a while back. It's been a couple years and I'm no longer taking the class, but I've met some absolutely fantastic people because of it, and I'm honored to call them friends. And to be able to provide my photography or graphic design skills when needed. Say, in the case of a logo for a belly dance troupe. 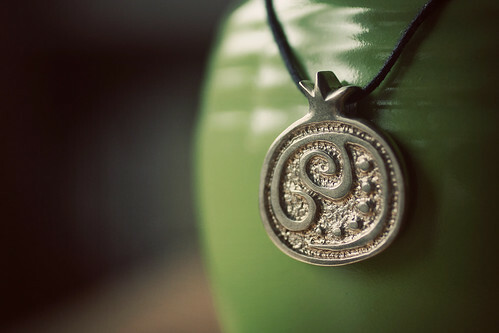 Who end up really liking that logo, and decide to take that logo artwork to a jeweler and have pendants made. And then, as if that's not enough already, they give you one of those pendants as a thank you. (That would be the necklace you see up there. )\n\nI was so honored and amazed, I was almost speechless. The jeweler did an awesome job and I think it turned out really great. As I've mentioned before, I don't wear necklaces that often, but I do really like to wear this one. Not just because it's \"mine\" but because it reminds me of my lovely friends.\n\nSo does it count as bragging if you get all mushy about it?